Amphenol RF releases quick connect SMA adapter ideal for test and measurement applications that dramatically reduces mating time and requires no additional tooling. 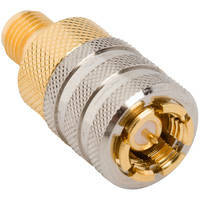 Danbury, CT – Amphenol RF is pleased to offer the SMA Quick-Connect adapter, a straight jack to straight plug configuration, as part of our broad portfolio of coaxial adapters. This precision machined 50 ohm adapter allows for quick and easy mating with all existing threaded SMA jack and plug connectors.